www.hetadina.com: සුර්ය විදුලි ජනක සවිකරමු..ගැටළු..හා විසදුම්..
සුර්ය විදුලි ජනක සවිකරමු..ගැටළු..හා විසදුම්..
තියාගන්න ඇම්පියර් 35 ක කාර් බැටරියක් ආරෝපණයට ඇම්පියර් තුනකට වැඩි ධාරාවක් අවශ්‍ය වෙනවා..එම සුර්ය පැනල ඔබට ගන්න පුළුවන් තැන් මම කලින් ලිපියෙන් දක්වා තිබෙනවා..බැටරිය ස්වයන්ක්‍රීයව ආරෝපණයට SOLAR POWER CHARGING CONTROLLER එකක් යෙදීම ඉතා වැදගත් වෙනවා..මේවා දැන් පිටකොටුවෙන් ගන්න පුළුවන්..ඇම්පියර් 20 ක එකක් රු 2800 විතර වෙනවා..මේ තියෙන්නේ එවෙගේ එකක්.ඒක තුල තියෙන විවිධ ඔප්ෂන් පහත පරිදි දක්වන්න පුළුවන්. 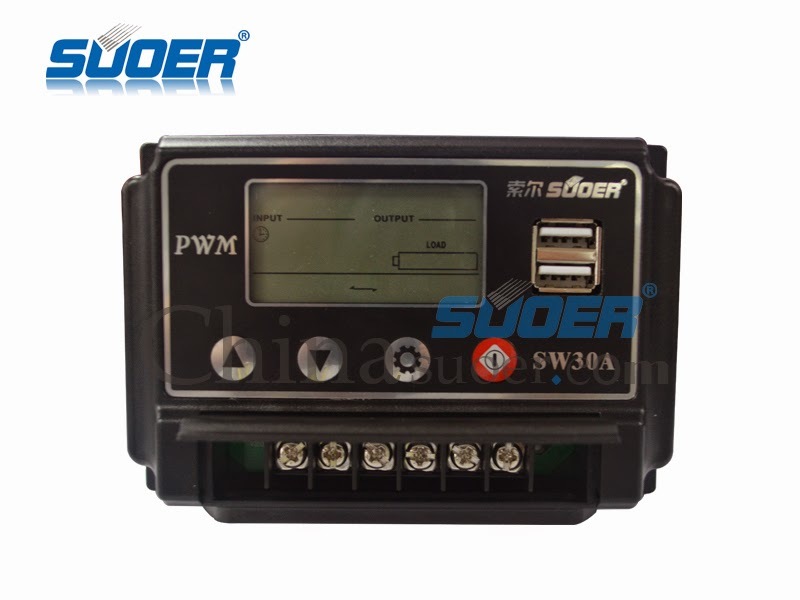 2.System identification voltage after a few seconds,it display the current controller maximum output current. 3.Overload protection, Low voltage protection, Overvoltage protection . 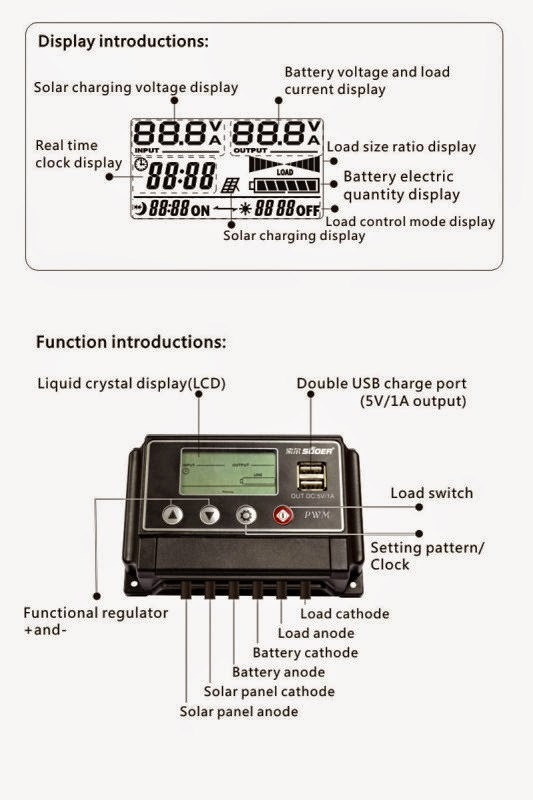 4.SW series solar charger has a total of 18 load control configuration mode for the user to choose from. 5.Load control mode 0 display. 6.Shows the load control mode(cycle approach). 7.2 shows the load control mode(Pure light-operated switch mode). 8.3 shows that the load control mode(electric drive,1-15 hours delay). 10.Mode 1 cycle to make an appointment time to adjust. 3. Reverse polarity & high/low voltage battery protection. 4. Output current & short circuit protection. 6. ON/OFF load switch at front of controller for convenience. තවත් අවුලක් තමයි සුර්ය පැනලය ආලෝකය ලැබෙන දිශාව අනුව තැබිය යුතු වීම.හිරු ආලෝකයට අංශක අනුවකට කෙලින්ම නිරාවරණ වීමට සැලැස්වීමට හැකිනම් එය වඩා කාර්යක්ෂම වෙනවා..ඉතින් මම කියලා දෙන්නම් ස්වයංක්‍රීයව හිරු එලිය දෙසට හැරෙන පැනලය සකස් කර ගන්නා හැටි..තවත් දෙයක් තමයි පැනලය දැඩි ලෙස රත් වීම.මෙය පාලනය කිරීමටත් ලේසි ක්‍රමයක් තියෙනවා ඔක්කොම කරුණු තවත් පොස්ට් එකකින් කියා දෙන්නම්..
Labels: සුර්ය විදුලි ජනක සවිකරමු..ගැටළු..හා විසදුම්..
soler panel එක වැඩ කරන්නේ ආලෝක ශක්තියෙන්ද, තාප ශක්තියෙන්ද? වොට් 100 ක පමණ පැනළයකින් ඇම්පියර් 60 battery 2ක් පැරැරල් ක්‍රමයට සම්බන්ද කර charge කල හැකිද . solar panel වල හොඳම brand එක මොනවද කියන්න .